I was trying to figure out what kind of holiday bento to make F&B this morning when Ben said to me "You know, I would like a reindeer cookie in my lunch, that could be the decoration." While I think that was his not-so-subtle way of getting his current cookie of choice, I didn't see a problem with the logic. One cute cookie = one decoration! 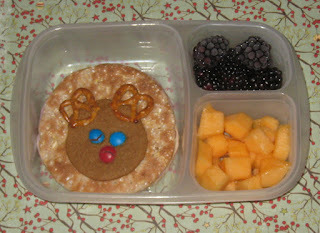 So the boy had a ham and cheese sandwich on multigrain rounds, topped with the coveted reindeer cookie. These are gingerbread reindeer, cut into circles, with M&M eyes and noses and pretzel antlers. To the right, he had blackberries and cantaloupe (a few of the blackberries are still frozen, not dusty). It's packed in our Easy Lunchboxes (also available on Amazon), since the reindeer cookies don't fit in most of our boxes. Hehe, that is a great idea! Cookie decoration is so cute! Thanks! They were pretty fun to make. I just cut the circles and the kids decorated them, so it was a nice little assembly line!